This is the Star Wars Rebels episode we’ve been looking for. Kanan is actually a fairly terrible Jedi. I knew to a certain extent that some Jedis were better and more skilled than others, but on the whole, masters usually ranged on a scale from “very good” to “nigh unbeatable.” Here, though, “Rise of the Old Masters” presents the idea that Kanan is… not all that great. Sure, he’s certainly capable of many of the typical Jedi tricks: saving Ezra when he falls, Force-pushing several Stormtroopers, performing Jedi mind tricks, wielding a lightsaber. But it’s clear Kanan doesn’t quite grasp some basic Jedi principles, which are as important to mastering the Force as the physical requirements. This goes to explain why he took so long to start training Ezra, and why he sent Ezra out leaping across buildings by himself in “Droids in Distress.” By failing to understand the basics, he knows he’s incapable of teaching them. This is made perfectly clear in the opening sequence, when Kanan attempts to teach Ezra. The episode plays it coy—depicting the lesson as a tough-love scenario, often used in so many “teaching” moments in television. There’s definitely a lot wrong with it, though: Ezra’s being taught on a ship that’s in the air for goodness sake. Plus Zeb and and Chopper are throwing rocks at him. This is inherently dangerous, but the episode plays it as an educational necessity, particularly with Kanan’s demands on Ezra’s need to focus and be more disciplined. The telling moment? When Ezra questions the meaning behind the infamous phrase, “Do, or do not. There is no try,” Kanan stammers, then admits he doesn’t really understand it either. Again, the episode plays it coy, seemingly ridiculing what looks to be nonsensical Koan (see: True Detectives’ “Time is a flat circle.”) The thing is, the phrase does make sense, particularly in the philosophical way; the show knows this, but it’s Kanan who doesn’t. This hints that Kanan, perhaps, is also a bit of a self-loathing Jedi. He doesn’t use his Jedi skills unless he absolutely have to; he’s a far cry from being the kind of Knight that can go on missions by himself. So it follows that he doesn’t quite believe in his skills as a Jedi, and he definitely doesn’t believe himself to be capable of teaching; this explains why he’s more than eager to pass Ezra’s training off to Luminara once he learns she’s alive. Kanan doesn’t see himself as worthy to teach Ezra, but Ezra sees it as abandonment. The crew/family dynamic is a lot more subtle here, as it balances between the idea of a father abandoning his son and a leader passing off an apprentice. Lack of communication becomes a theme here, whether its the inability to explain an idea, detail the plans of a rescue mission (particularly when it falls apart), communicate via jammed signals, and interpret Force presences correctly (also, flying creatures mistaking the Ghost as a potential mate). These issues lead to predictable disasters when everything in the rescue mission goes awry, predictable enough that the entire mission was orchestrated by the series’ big bad, The Inquisitor. Tagged briefly at the end of “Spark of Rebellion,” The Inquisitor is, at this point, fairly cliched and generic, as far as villains go (more about this in the Stray Observations)—he even performs the “dress the hero down” trope while fighting Kanan. What makes this work, though, is that he reveals crucial information about Kanan that isn’t privy to us. 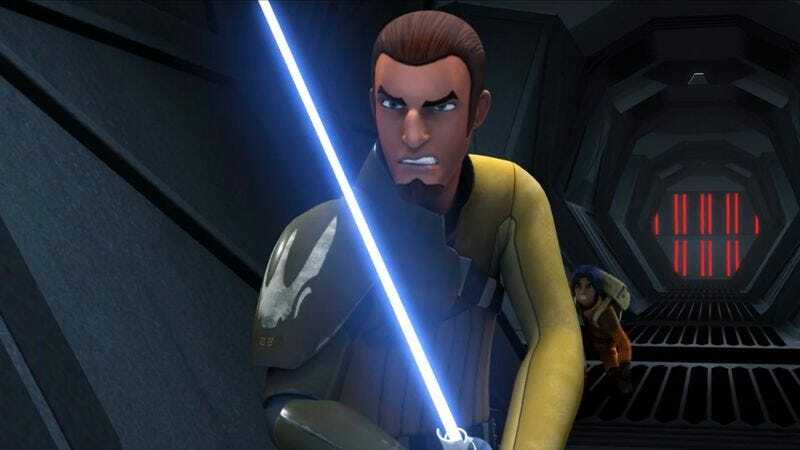 He quickly diagnoses Kanan’s sloppy Jedi abilities and uses Kanan’s own words about Ezra being undisciplined and unfocused against the Jedi himself. The most telling moment is when he tempts Ezra to join the dark side. When Ezra asks what the heck that is, the Inquisitor laughs, amused that Kanan didn’t bother to tell him about yet another basic Jedi tenet (a particularly important one). “Have you taught him nothing?” he asks, a statement that most likely hits Kanan deeper than his expressions would say. I tend to love episodes that separate the cast and forces them to work on their own, and this episode handles the separation nicely. We get more with Sabine in her natural element, working the computers and blowing stuff up. Zeb thrives his elements, beating up Stormtroopers with glee. Hera doesn’t do much, but she does arrive at the right time in the end to save her crew, even if it comes off a bit hokey. The lightsaber battle between Kanan and the Inquisitor is definitely the highlight, the battle clear and tense, a step up from the somewhat shaky bo-rifle battle between Zeb and Kallus in “Droids in Distress.” The episode feels a bit more confident in its characters and its story, which is definitely welcome. “Rise of the Old Masters” ends with its main characters finally understanding. Kanan resolves himself to teaching Ezra, grasping the true meaning behind “Do, or do not. There is no try.” Ezra sees his master in a new light, recognizing his flaws but his commitment to teaching him. The two resume their training, grounded, unlike the shakiness of their training in the air. Here’s hoping there’s a lot to be derived from this burgeoning relationship: Ezra growing into a more refined Jedi, Kanan growing into a more refined human. The one thing that held this episode back from a full A? Chopper almost killing Ezra. I’m sorry, but Chopper is not working (the show admits as much by leaving him out of the majority of the action). To be fair, Zeb is just as much at fault with the near-murder as Chopper, but Zeb at least shows some signs of remorse, while Chopper throws yet another bottle at the boy after he’s rescued. I’m assuming Chopper is actually an Empire plant, attempting to kill each member of the crew one at a time. THIS WEEK IN EMPIRE EVILNESS: Nothing too over-the-top here, which is fortunate, so I’ll just point out some of the ridiculousness of The Inquisitor, despite the fact that he worked very well here. I mean, the guy has sharpened teeth. Also, he does that thing where he walks all menacing-like while everyone is running from him. Kanan: “It’s difficult to teach.” Zeb: “He means, it’s difficult to teach you.” Great piece of misdirection. 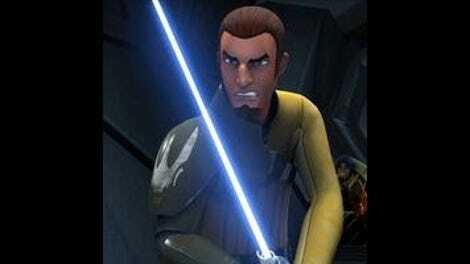 Kanan clearly is filled with self-doubt but Zeb interprets it completely wrong, putting the blame on Ezra. Smart use of staging. There’s a distinct parallel between Ezra using the Force to save Zeb in “Droids in Distress” and Kanan using the Force to save Ezra in this episode. The show seems to be putting them at the same level, at least thematically. See also: working together to lift the blast doors as they escape the prison. Disney’s hyped-up premiere of “Spark of Rebellion” on ABC was just as you’d expect. The Darth Vader cameo brought nothing new, other than let everyone know that the genocide of the Jedi is still ongoing. But it is good to see Disney really pushing this show so hard.